WEST LAFAYETTE, Ind. -- Researchers at Purdue University have determined the high-resolution structure of immature Zika virus, a step toward better understanding how the virus infects host cells and spreads. Zika belongs to a family of viruses called flaviviruses, which includes dengue, West Nile, yellow fever, Japanese encephalitis and tick-borne encephalitic viruses. Although only the mature forms of flaviviruses are considered infectious, the virus population secreted from host cells is a mixture of mature, partially mature and immature virus particles. "It is, therefore, probable that the immature form of Zika also plays a role in virus infection and spread," said Michael Rossmann, Purdue's Hanley Distinguished Professor of Biological Sciences. The research team was led by Rossmann, with Richard Kuhn, both professors in Purdue's Department of Biological Sciences, as well as postdoctoral research associate Vidya Mangala Prasad. Findings are detailed in a research paper appearing online Monday (Jan. 9) in the journal Nature Structural & Molecular Biology and it will be published in a future print issue of the journal. "I think these findings open the door to begin to explore the assembly process of the virus," said Kuhn, director of the Purdue Institute of Inflammation, Immunology and Infectious Disease (PI4D). "We see clear differences between the structure of the immature virus and the mature virus. Not only are there differences in the outer structure, but the inner core must also undergo some significant changes during maturation. We need to study what these changes are and why they occur." Rossmann and Kuhn also led a team that last year determined the structure of the mature Zika virus. Research into a virus's structure provides insights important to the development of effective antiviral treatments and vaccines. The researchers used a technique called cryo-electron microscopy to reconstruct the immature virus's structure at 9 Ångstroms resolution, or about a thousand times better resolution than would be possible with a conventional light microscope. The genome of the virus is housed inside a protective envelope that includes a lipid membrane, an envelope protein, a precursor membrane protein and a capsid protein. The Purdue researchers are the first to learn the position of the capsid protein in the immature virus, which plays the critical role of recognizing the virus's genetic material and acts as a chaperone to guide these RNA strands into the virus for assembly. The envelope protein is essential for the virus's binding, attachment and fusion to host cells during the infection process. The membrane protein cleaves from the mature virus as it is released from the host to infect other cells. A map of the immature virus's structure revealed details about the proteins, showing that the envelope and precursor membrane proteins are arranged in 60 spike-like features on the virus's surface, whereas the capsid protein is located on the internal side of the lipid membrane. The structure differs from the mature Zika virus in that the membrane protein in the mature virus is covered by the envelope protein. Both proteins exist on the surface of the immature version of the virus. Findings also show differences between the immature Zika virus and immature versions of other flaviviruses. 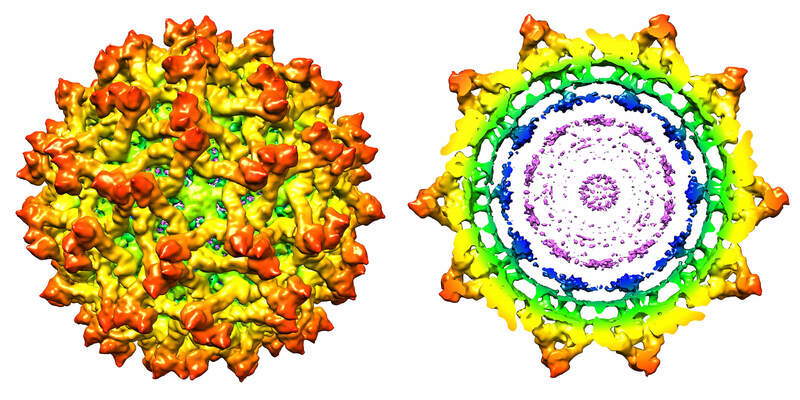 Notably, it contains a "partially ordered capsid protein shell" that is less prominent in other immature flaviviruses. "However, the residues that are responsible for the Zika's pathogenicity are largely unknown," Rossmann said. Rossmann and Kuhn have studied flaviviruses for about 15 years and were the first to map the structure of any flavivirus, starting with the dengue virus in 2002 and West Nile in 2003. The Nature Structural & Molecular Biology paper was authored by Mangala Prasad; staff scientist Andrew S. Miller; assistant research scientist Thomas Klose; former doctoral student Devika Sirohi; laboratory manager Geeta Buda; Wen Jiang, a professor of biological sciences and chemistry; Kuhn; and Rossmann. The current Zika virus (ZIKV) epidemic is characterized by severe pathogenicity in both children and adults. Sequence changes in ZIKV since its first isolation are apparent when pre-epidemic strains are compared with those causing the current epidemic. However, the residues that are responsible for ZIKV pathogenicity are largely unknown. Here we report the cryo-electron microscopy (cryo-EM) structure of the immature ZIKV at 9-Å resolution. The cryo-EM map was fitted with the crystal structures of the precursor membrane and envelope glycoproteins and was known to be similar to the structures of other known immature flaviviruses. However, the immature ZIKV contains a partially ordered capsid protein shell that is less prominent in other immature flaviviruses. Furthermore, six amino acids near the interface between pr domains at the top of the spikes were found to be different between the pre-epidemic and epidemic ZIKV, possibly influencing the composition and structure of the resulting viruses.